Meze is probably my favorite way to eat. Little plates of everything. During summer is the time when we mainly eat like this. I like to have a few containers in my fridge will all these delicacies ready for an easy meal. 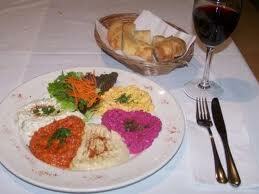 Meze can be really anything that is in season and served cold, I have not yet seen a hot meze here in Turkey. They can range from salads to any veggie put into garlic yogurt to a plate of watermelon. What can you find on a Meze tray if you come to Turkey? Slices of Turkish style fetta cheese drizzled with olive oil and served with olives. All of this is usually washed down with alcohol if eaten at a restaraunt. What are your favorite Meze dishes? Want the recipe? Let me know and you can be making wonderful Meze tables at home. I have written this post in response to my beautiful friends post on her blog The Simple Things. She did me the honour of posting about my blog on hers She is one of my closest friends and I look forward to seeing her again soon. If you are anything like me you are curious about different cultures and people, what they do and what they eat. This has lead me to cook various things other than just the average meat and 3 veg. I came to Turkey 6 years ago and what an adventure,! many things have happened including living the way the locals do and learning all their culinary secrets. Turkish food seems to becoming more and more popular these days and I can understand why. The Turkish food culture is one of appreciating fresh at its best. Combining ingredients to compliment each other and eating in season. I have lived in many areas of Turkey from the European side to Middle Anatolia to the Mediterranean. All the areas have their own distinct dishes and styles but there are many dishes that the Turks as a whole have in common. Those are the ones you will probably find at your local Turkish restaurant. What would most people order at a Turkish Restaurant if they have had no exposure to the food before? I'm thinking the dip platter(I have checked online and most still seem to be serving this)so I will give you the recipes for all those beautiful looking dips and you can do these at your next BBQ or dinner party and impress your friends. We will start with Baba Ghanoush, Beetroot dip and Hummus. You will find these very very easy to make. You might have all have your favorite recipes already for these as I know in most areas these are sold in the fridge sections of most supermarkets. I will be giving you the recipes as I know them from the average Turkish housewife. Cook the eggplants whole in your oven until black. Place them into a plastic bag until cool. Take off the blackened skins, rinse off then chop roughly. Add everything into the yogurt and serve. You can garnish with dried mint or chili. I love this and make it all the time. I usually eat it as a side with salad. 1 kilo of cooked beetroot - you can boil it or roast it to be fancy - you can add it in raw if you like but it doesn't give you the deep red colour. Peel and grate the cooked beetroot. Add everything else, stir and serve. Drain the chickpeas and put everything into a food processor or use a hand blender and then blend until it is a paste. Add in everything else and blend again. When you add in the sesame paste add half in first, taste to see if you want more, then add the rest(some people find it a bit strong) same with the garlic add to your own taste. I would probably add in 4 cloves. With the olive oil I would probably put in a couple of tablespoons, if the mix looked a bit dry then add in some more. With all of the above dishes you can add olive oil.